﻿ Bamboo Green Central Hotel, Da Nang | FROM $15 - SAVE ON AGODA! "Room we stayed had great view of the city and Dragon bridge." 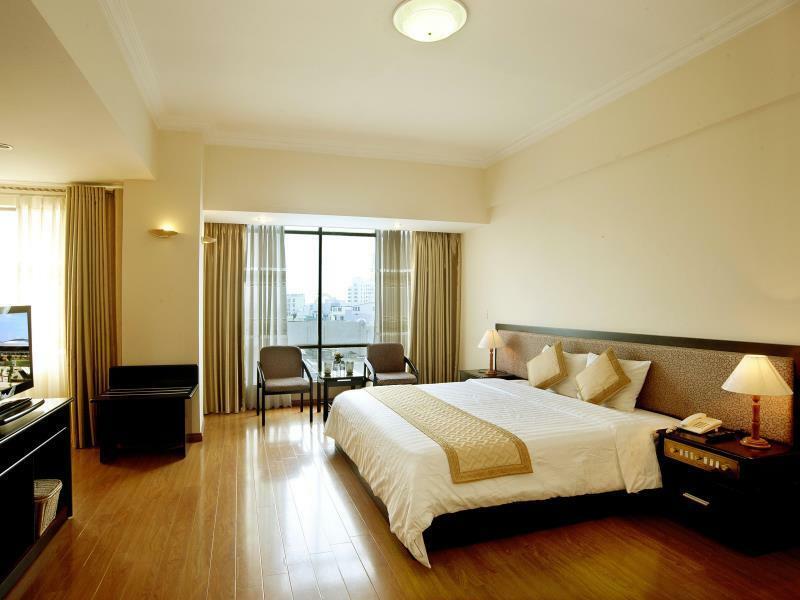 Have a question for Bamboo Green Central Hotel? "Location a good 20min walk from the Dragon bridge." "Clean and good for 2 nights." "I would recommend this hotel, friendly staff, clean rooms"
"Clean and quiet room, breakfast adequate, helpful staff." Featuring 42 rooms, this 3.5-star property offers a wonderful mix of Vietnamese and European influences. With quick access to Danang International Airport, this spot is a perfect choice for the quick stopover or extended trip. Attractions like the Cham Museum, Theatre Center, or Tuong Theatre are all within walking distance. Marble Mountain is also a quick taxi ride away. 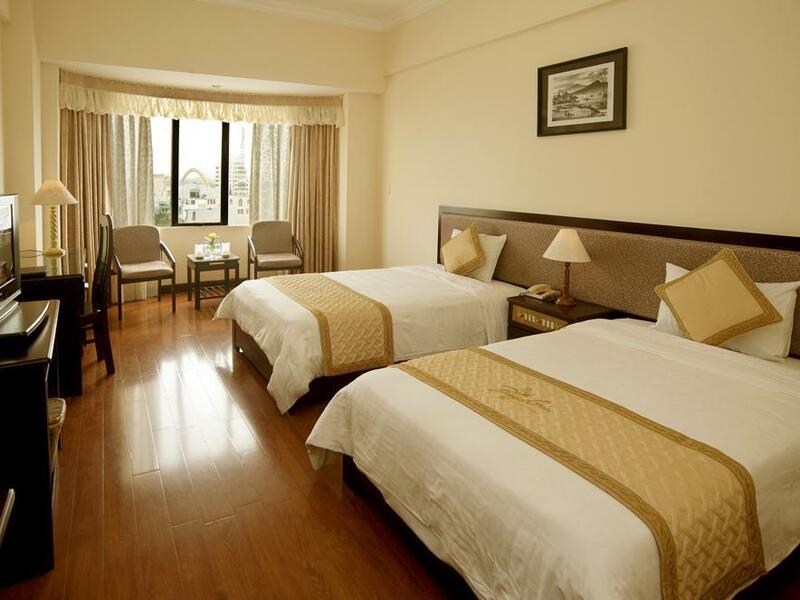 With new amenities and a hospitable charm, the Bamboo Green Central Hotel awaits your next stay in Danang. Offering an excellent location, it is definitely worth your stay. "Staff met my many requests with a smile." Children from 1 to 6 years get free breakfast. Children from 7 to 11 years sharing bed with their parents will be charged for breakfast at 2 USD. An extra bed will be provided for children aged above 12 years. Da Nang suffers from lightning speed development and as such there's too many hotels and cafes without many minimarts and restaurants close far too early. It makes it a beautiful city with very minimal convenience. This hotel was the best I stayed at. They gave me the room I booked and paid for and were friendly about it. Much more than I can say about the two others I stayed at. The view from the seventh floor was stunning, the room was big, the shower had hot water and everything worked great. If you're going to Da Nang, book here. Room was quiet even though outside streets were busy, breakfast did not disappoint, room comfortable and clean and in advance of expectations given the budget price. Staff met my many requests with a smile. Many thanks for your stay at Bamboo Green Central hotel. We will try to improve service better. Hope to have your stay again. It was the first place I stayed at in Da nang where there was someone who spoke English at the front desk every hour of the day or night. The room had a nice view and all in all it was a great value with breakfast included. Room we stayed had great view of the city and Dragon bridge. Slightly hard bed, CRT TV with local Vietnamese channels mainly. Bathroom is clean but will wet the floor when you use the shower in the bathtub, though there's a shower curtain. The buffet breakfast is so so only and remains the same during our 3 days stay. Location is not that great, but need to walk a fair bit to reach Han Market and the river side, but most of the time it's safe enough. Not all hotel staff able to speak English, but good enough to understand after a bit of hand signs and pointing. No problem with getting taxi from hotel. Many thanks for choosing our hotel to stay. We will try to improve service. Hope to serve you again. This hotel was a decent place to stay for a business trip. I was there for 16 days and found it quite a comfortable place to stay. The staff were mostly friendly and even left some fruit for me in my room when they cleaned every day. The breakfast wasn't much to my taste but I think the quality was fine for those with more traditional and basic tastes for Asian cuisine. I had no security issues. The hotel apperance is abit old,but the lobby is big and beautiful.The breakfast is good and delicous.The room is clean and bathroom is provided with full amenities.The location is far from the HAN MARKET and do not have much restaurants around the hotel.With the rate i paid for the superior twin room,i am very satisfied. Everyone at the hotel was very nice, and unlike other places I've stayed in Vietnam there was always, at any hour of the day or night, someone at the front desk who spoke English. The shower didn't work well and there were signs here and there of neglect but, all in all, my standard room was a very good value. Excellent rooms and service. 5 mins from airport. This is a great hotel if you are looking for something close to the airport. They arranged a taxi for us at 4:30 am. 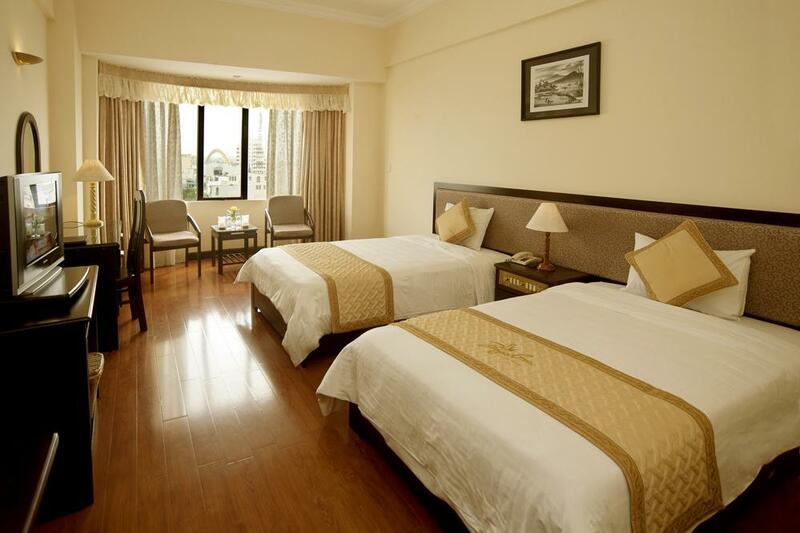 Rooms are excellent with all amenities. Service was outstanding! Would recommend this place!! very helpful hotel staff who helped us to book private tour to hoi an and my son. the private tour was good and the guide gave us sufficient time to explore. breakfast on both days were satisfactory. room was clean and spacious enough for 3 persons to stay comfortably. free wifi. It’s old hotel the location is in downtown but not thing near there. The room is old and dirty. When it is rain the water come through my room even you close the window. So the carpet is wet and smells not so good. The front desk is good try to help. Breakfast is not so good. Clean and quiet room, breakfast adequate, helpful staff. Location a good 20min walk from the Dragon bridge. In house cafe advertised but not open. It's good to stay in Bamboo, hotel is located in the center. Room is nice, price reasonable. upgrade my room since i am not happy with the first room given to me. friendly staff and responsible. big room with all facilities. will come back to this hotel again when i come to danang. I had an unpleasant surprise when I requested an invoice (an official invoice which could be accepted by the Vietnamese Tax Department, since my company is registered in Vietnam, and Agoda's invoices are not accepted). I first got a flat refusal. Then, after insisting, they eventually agreed to make an invoice, but I had to pay some extra 20% (while VAT is 10% only), basically because they could not evade taxes. I lost half an hour arguing, and they were ready to spend more for a few dozen cents, plus the 20%, and this is unacceotable. I wouldn't recommend this hotel to anyone. I stayed in this hotel and I extended it to 10 days but when when I checked out the hotel management charged me $50/night because at the time of checkout the rate has changed!! I didn't have time to argue because they had my passport and I had to catch the flight. I didn't have time to call the police. Even if I called the police I couldn't speak Vietnamese. Be aware!! A hotel located quite good but with worn rooms. My room was a big corner room with a beautiful view over the city through 10 meters of windows. Unfortunately it had a broken safe and my friend’s room didn’t have any safe at all. You can recognize that this area and hotel don’t have so many tourists from outside Asia. The supply for breakfast was different in compare to other Vietnamese hotels and I didn’t eat so much. very social hotel, price doesn't reflect from the price it charged, room facilities very old, shouldn't charge at marked price. Previous mentioned buffet breakfast, finally only served 2 fixed dishes, no sufficient serve of coffee, plus not hot!! The weather was terrible when I was there so I was trapped in the hotel, but this was not a great place to be trapped. Everything was run down. The rain came in through the closed window, the air conditioner dripped from the vent above the doorway. Maybe this was a decent place 10-15 years ago, but now everything is pretty shabby. The massage room didn't have clean sheets. I tried to pick the hairs off of it before I lay down, but it was quite nasty. This was one of the worst experiences my boyfriend and I had in Vietnam. We only spent 1 night in Da Nang thankfully. Upon arriving the rooms and corridors smelled of smoke. We decided after the extensive travel to Da Nang to have our first massage in Vietnam. We headed up to the top level for a massage. When asking about about massages the lady gave me a strange look, she was an older woman which I though couldn't be dodgy so we agreed to the price and headed on in. The minute I stepped into the room I realized that this was no "massage" place. The rooms were terrible and sterile looking, pillows smelt of sweat. This was the most awkward experience of a massage I've ever had. The girl used her bare hands without moisturizer or oil, needless to say my skin was red raw by the end of the novice massage. As I was about to leave she appeared awkward and tried to keep me in the room saying my boyfriend had not yet finished. Our towels stank of smoke as we showered after the experience. Breakfast in the morning was limited and cold. Possibly the worst we've had on the trip so far. Da Nang is a highly business orientated town, not the most brilliant of cities to visit.